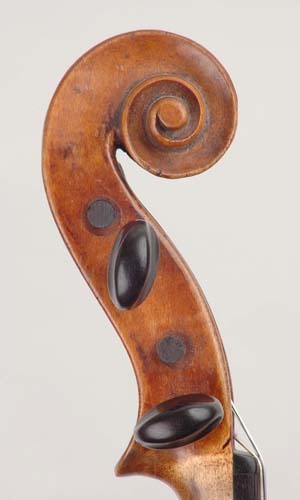 Léopold Renaudin was a french violin maker who was born, like may of the greatest French makers, in the city of Mirecourt in the Lorraine region. He left home for Paris at the age of 16 and apprenticed with an unknown violin maker, eventually working from home and cultivating a profitable business. He was a skilled maker, who made a cello for Boccherini and worked for the Academie Royale de Musique. Renaudin is particularly known for the high quality of his basses. 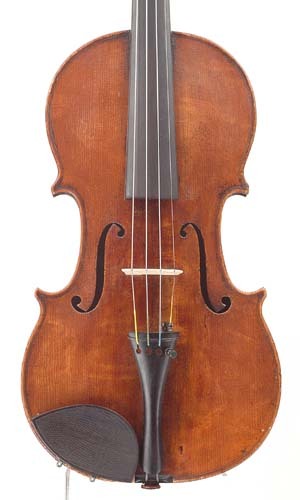 Sadly, Renaudin's fame as a violin maker is overshadowed by his role in the political turmoils that embroiled France in the late 18th century. In 1789 the French Revolution exploded, fueled by widespread hunger and discontent and imbued with an added ideological potency that was a byproduct of enlightenment ideas. The French monarchy collapsed, King Louis XVI was guillotined, and a Republic was declared. Maximilien Robespierre, controversial leader of the Committee of Public Safety. Renaudin fervently supported Robespierre, even going so far as to follow him around with daggers and a pistol in order to look after his safety. Robespierre's most controversial legacy is his leadership role in the Committee of Public Safety, which formed the de-facto leadership of the French Republic from 1793 - 1794. In April of 1793 the Committee created a criminal court in order to "get rid of enemies of the revolution," made up of reliable supporters of the Committee itself. Renaudin was awarded a position as a juror to the court by Robespierre himself, and from that position he judged some of the most famous French personalities sentenced to the guillotine, such as the French queen Marie-Antoinette. In The Violin Makers of the XVIIth Century Sylvette Milliot writes that Renaudin "was one of the most terrible jurors of the court. He prided himself on never having wished for acquitting any accused person, or on the blood he had made shed and on his desire to make it shed still more." Historians now call this period of Committee of Public Safety leadership "the reign of terror," during which the court Renaudin sat upon executed tens of thousands of individuals, many by guillotine. The injustices perpetuated by the Committee of Public Safety didn't last, and on the 27th of July, 1794, Renaudin and the many other top officials were taken into custody. Robespierre was guillotined the next day, and Renaudin was imprisoned along with the other members of the criminal court. They would all eventually stand trial for their various injustices, not limited to the concealment of witnesses from the defense, absurdly short sham trials, death warrants issued without names (to be filled in as needed at a later date), and other legal injustices. Renaudin claimed, during his trial, that he was "irreproachable," having simply followed orders in the pursuit of justice. He is reputed to have said that "I was used as a hatchet. One can't bring an action against a hatchet!" The court ignored Renaudin's excuses and sentenced him to death, along with many of his political comrades and fellow jurors. When the sentence was read allowed, Renaudin remarked "I die innocent, for having loved my country too much. I certify I never had any ill intention." The next day, Renaudin was executed by guillotine, along with 15 other jurors, for his role in the bloodbath that was the "reign of terror."